Native American Indians were a deeply spiritual people and they communicated their history, thoughts, ideas and dreams from generation to generation through Symbols and Signs such as the Yei symbol (Yeii). The meaning of the Yei symbol represents the Navajo Yei Spirit who mediates between humans and the Great Spirit. The term Yei derives from the word Yeibicheii meaning the Holy People. Navajo Yei (Yeii) spirits, or deities, are believed to control elements such as the rain, snow, wind and sun and control the night and day. Most of the Navajo deities can be either beneficial or harmful to the Earth Surface People, depending on their mood or impulse or on how they are approached. The Yei is also believed to be associated with the rainbow goddess. 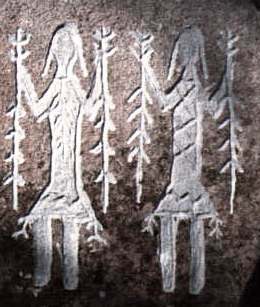 Depictions of Yei were commonly created on Petroglyphs and Sand Paintings.